Mexico City is a conurbation like no other. Bustling, seductive, chaotic, eccentric and exhilarating – visitors leave with an enriched respect for its culture and history. John Hagan pinpoints some of the jewels amongst a vast wealth of treasures. 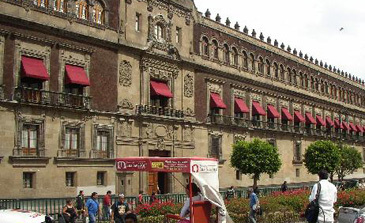 The whole of the eastern side of the Zocalo, a vast open plaza which was once the ceremonial centre of Aztec life, is occupied by the imposing 200 meter-long edifice of the National Palace. Originally commenced by Spanish conquistador Hernan Cortes after he defeated Aztec ruler Mochtezuma, it served as seat of the Spanish Viceroys during the colonial period before becoming the residence of the president following Mexico’s independence in 1821. The whole history of this progression from Aztec rule to Spanish conquest and Inquisition, national revolution to the mid-20th century is graphically told on three enormous murals, painted between 1929 and 1945, by the renouned Mexican artist Diego Rivera. These vividly illustrate a history which unashamedly depicts the brutal treatment meted out to the indigenous population by the Spanish colonizers. Visitors often have fun endeavouring to identify some of the many historical characters populating the frescos. Rivera’s almond- eyed women proliferate, and it is hard not to spot Rivera’s wife, Frida Kalho, together with some of his own personal heroes like Emiliano Zapata and Karl Marx. While entry to the National Palace is free, it may be advantageous to hire a guide to explain the detail and significance of the mural. Adjacent to the National Palace is the Metropolitan Cathedral – still the largest cathedral on the whole American Continent, but like many of Mexico City’s heritage buildings is slowly sinking under its own enormous weight. Located at the junction of Lazaro Cardeuas and Manuel Gonzales Streets, the Plaza is representative of the nation’s cultural heritage. 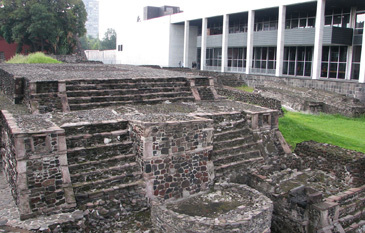 Aspects of Aztec, Spanish and Mexican civilizations are displayed in the form of the ancient Aztec remains of the once thriving city of Tlatelolco, the Spanish Cathedral of Santiago (constructed by the Spanish using Aztec stone) and the modern Mexican Department of Foreign Affairs. It was here, on August 13, 1521, that the Aztecs made their final futile stand against Cortes and his men resulting in the deaths of 40,000 warriors, and where 197 students were killed by the Mexican army in 1968 when protesting against the staging of the Olympic Games. World renowned tenor, Placido Domingo was raised in the adjoining apartments and when the area was rocked by an earthquake in 1985, causing 8,000 deaths, Domingo returned to offer help and raise funds to rehouse those left destitute. A great site close to the City centre which illustrates many aspects of Aztec culture and construction prowess as displayed by their temple remains. Entry fee 45 pesos (4,200 won) with an English speaking guide available for hire. The ancient Aztec canal system over which Mexico City has been largely constructed has long since disappeared with the exception of the "floating gardens" of Xochimilco (www.xochimilco.df.gob.mx). A shallow network of canals (27 km south of downtown), this living remnant of the Aztec civilization, has been preserved with the fertile ‘islands’ between the canals still producing flowers, vegetables, honey and medicinal plants for the City markets. 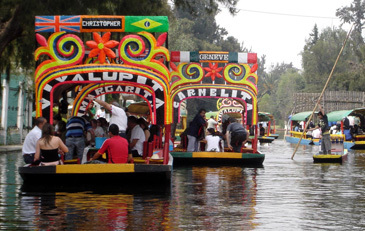 Xochimilco also doubles as Mexico’s ‘Venice’ and is home to about 1000 ‘trajineras turisticas’, colourful, flat bottomed boats, punted by gondoliers. At weekends, locals, often in family groups, descend on the area to hire a boat (250 pesos/hour: 23.000 won) to relax, carouse, feast and imbibe while being leisurely transported along the waterways. Some bring their own food while others purchase eats from floating vendors. Feel like having a party? Hire a mariachi or marimba bands to provide the music. Try to avoid Xochimilco at weekends when visitation peaks – the experience is much more pleasurable during the working week. 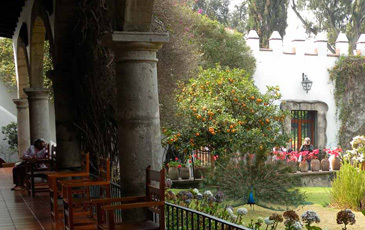 Situated in the suburb of Coyoacan (Londres 247) is the Casa Azul (Blue House), so named because of its surrounding cobalt walls, in which Mexico’s most famous female artist, Frida Kahlo was born and lived (www.museofridakahlo.org.mx). 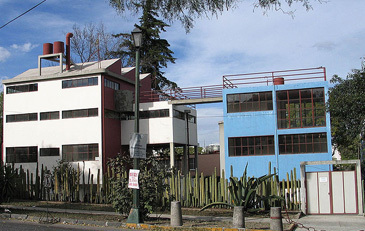 In this house, which she shared with her husband, Diego Rivera, she painted most of her famously colourful and tormented canvases. Stricken by polio at an early age and later seriously injured in a train crash she nevertheless became a prolific artist, and an array of her paintings is on display, as are the regional trademark costumes, her jewelry together with some of her giant papier-mache creations. The dining room, where Frida’s pet spider monkey and her parrot would perform tricks for house guests, still has its floor painted bright yellow, and Rivera’s coat remains hanging behind the door in the master bedroom seemingly awaiting his return. Frida’s studio, complete with easels, paints and canvasses, is still intact, as is the bed on which she initially learned to paint while recovering from polio. In the corner stands her wheelchair and the plaster corset she wore to support her damaged spine. Strolling around the Blue House, which is itself a work of art, gives the visitor a sense of her troubled life and her passion for Mexico. Entry fee is 55 pesos (5,100 won) and tours with an English speaking guide are available. A few blocks away from the Blue House is the Leon Trotsky Museum (Avenue Rio Churubusco 410) where the banished Russian leader (one of Frida’s lovers) lived and assiduously tended his garden before being brutally murdered by Stalinists. 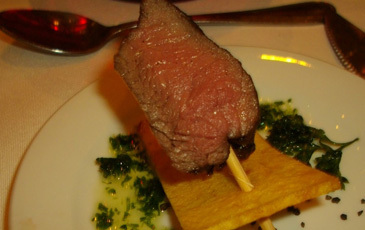 Also in Coyoacan (Allende 2) and close to the ‘Blue House’, El Morrel serves genuine Mexican fare at user-friendly prices. Watch your tortillas being made and cooked and then sample them with goat meat or chicken fillings. Try a plate of the hearty Aztec soup, cochinita pibil (seasoned pork), guacamole with chicken tacos, and a local beer, or perhaps a glass of mezcal or blended papaya and guava cordial. On hand is a mariachi band with a retinue of suitable serenades to complement the relaxed, intimate and friendly ambiance. Tel: 5554-02-98. Walk one block from El Morrel to Café El Jarocho (www.cafeeljaocho.com.mx) and enjoy a cup of coffee from freshly ground beans(12.5 pesos: 1,150 won), then cross over to the park opposite the Mercado (Market) Coyoacan (which specializes in clothes and souvenirs) to watch the park’s grey squirrels and the ongoing theatre of the streets.